There is work going on here at all times. Sometimes lively, sometimes subtle, it seems like the job is never finished... we scratch built it that way. The roundhouse itself is set in a quiet switch yard ambiance, with a few curious critters around to 'supervise' the work. Includes a 'working' switch yard, its just not working too hard (still prototypical!). Locomotives sit, signal, then sit some more amid scattered short wheel clatter and yard chatter. Even if you can't see it, they're always doing something 'somewhere' in the facility. The overall setting is a quiet urban industrial ambiance of the appropriate era. 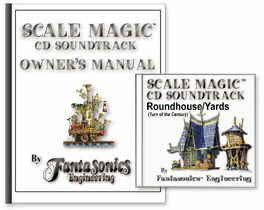 CD includes day & night scenes... but someone may be sleeping on the job at any given time.